While the bulk of the 2012-13 16U team stayed together to move up to 17U, the addition of three new players makes it all new again. When you consider our 17U boys team came into this tournament cold, not having played any competitive ball yet this season and coming up against teams that had the experience of at least one, if not two tournament competitions to feed off, they acquitted themselves quite well. As one might have expected, they started slowly, with nerves showing as they took on the KW Predators. But the boys settled down quickly and made the Predators work hard for their 1st set 25-27 win. In the 2nd set, Durham Attack was focused and in control from the first serve, taking the set 25-15. The Predators pushed back in the tiebreaker set, and while the score was closer, Durham’s momentum didn’t waiver, carrying them through to a 15-9 finish. They came up against Mississauga’s Pakmen 17U in the 2nd game, a harder challenge as Pakmen had already experienced the pressures of competition. Our boys came out pumped and it made for a very interesting matchup. After a very balanced set, with plenty of give and take from both sides, DA gained the upper hand and the last few consecutive points went DA’s way, for a 25-20 win. The boys played smart and focused in the 2nd set, but the breaks just didn’t fall their way. While their blocking was solid and their set/slam combinations proved very effective, their service game let them down and they fell behind. They struggled to make up the point spread, but eventually lost 18-25. Another close tiebreaker resulted, with the teams trading points on a one for one basis, while giving the audience an entertaining round of rally’s. Pakmen ended it with a solid return followed up by an excellent ace to take it 14-16. The quarter final match had Durham Attack facing the Pakmen 16U team. The 1st set was all DA, winning 25-16 with solid blocking, excellent passing and setting, and consistent hard hitting from everyone. The 2nd set started the same, but after a couple of bad breaks on calls, the momentum swung to Pakmen as they took advantage of those breaks, playing hard for their 21-25 win. Another 3rd set and Durham made good use of all this extra court time. While the Pakmen kept pace through the 1st half, actually going ahead 8-10 before a DA timeout stopped their drive, with solid defence and focussed play, DA regained control and went on to win 15-10. The semi-final against Markham Stingers was a close, very competitive clash between two very determined teams. Trouble came early to DA in the 1st set though, as they dropped the first five points, putting them in the undesirable “catchup” position. But they didn’t give in to the added pressure, continuing to press for every point and making The Stingers fight even harder for theirs. A close match like this one is what the fans come for and they weren’t disappointed. Only one team can emerge victorious however and the Stingers managed to fend off DA’s pressure and took the game in two sets, winning 23-25 and 16-25. This brought Durham to the Bronze medal match: their opponents – The Niagara Rapids. Strong competition had been the order of the day and this game proved to offer nothing less. Happily, Durham picked this time to pick up the consistency of their play, with strong serving from everyone, accompanied by timely blocking and well set hitting. Of course Niagara also came to medal, so the action was fast and hard, back and forth and exciting. 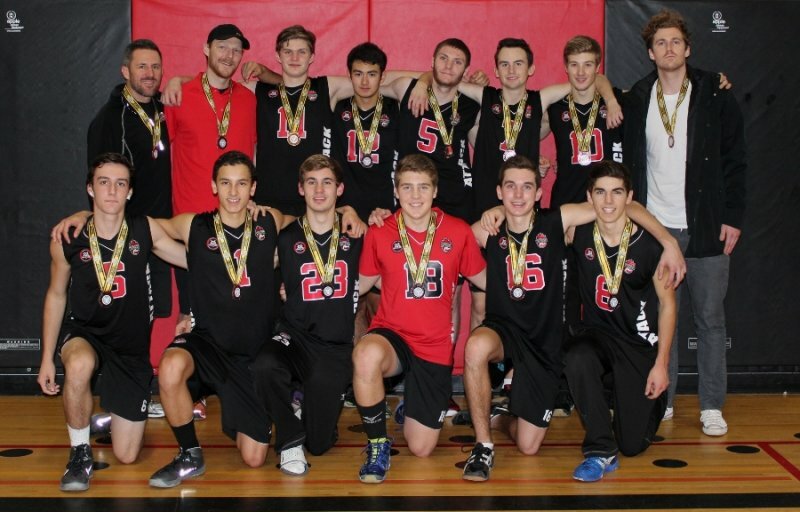 In the end, Durham Attack prevailed, and took the Bronze medal in two sets – 25-17 & 25-23. Yes, as I stated in the beginning, the Durham Attack 17U boys acquitted themselves quite well this day. After smoothing out some rough patches, calming new season nerves and most of all dusting off the cobwebs, the boys brought it together, didn’t let the negative aspects of tournament play get to them and gave everyone watching reason to believe this will be a very entertaining season.